This computer simulation shows gravitational waves generated during a black-hole collision. The scientists and engineers who made the first-ever direct detection of gravitational waves are now $3 million richer. In February, researchers with the Laser Interferometer Gravitational-Wave Observatory (LIGO) project announced that their detectors had recorded evidence of gravitational waves — ripples in the fabric of space-time whose existence was predicted by Albert Einstein in 1916 in his theory of general relativity. 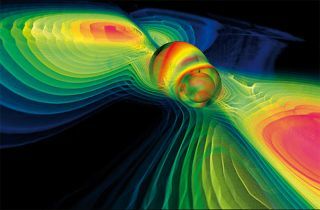 These ripples were generated by the faraway merger of two black holes, each of which harbored about 30 times the mass of the sun, LIGO team members said. "This discovery has huge significance — firstly, as evidence for general relativity and its predictions of black hole interactions, and secondly as the beginning of a new astronomy that will reveal the universe through a different medium," astrophysicist Stephen Hawking, who won a similar special prize in 2013, said in a statement. "The LIGO team richly deserves the Special Breakthrough Prize." The three founders of the LIGO project — Ronald Drever and Kip Thorne of the California Institute of Technology in Pasadena, and Rainer Weiss of the Massachusetts Institute of Technology in Cambridge — will share $1 million equally. The other $2 million will be split among the 1,005 authors of the discovery paper, as well as seven other people who made important contributions to the LIGO effort, Breakthrough Prize representatives said. The Breakthrough Prize Foundation awards annual $3 million prizes in Life Sciences (up to five per year), Fundamental Physics (up to one per year) and Mathematics (up to one per year), as well as "special" prizes in these fields that can be granted at any time. The LIGO team will be recognized at a ceremony this fall for its Special Prize in Fundamental Physics. "This amazing achievement lets us observe for the first time some of the remarkable workings of Einstein’s theory," Edward Witten, the chair of the Breakthrough Prize Fundamental Physics Selection Committee, said in the same statement. "Theoretical ideas about black holes which were close to being science fiction when I was a student are now reality."